So, it’s an interesting concept, except 90% of what you want to do with the app is hidden behind paying for a subscription. They’ll tell you that you can message your matches, but unless that person actually subscribed, they’re not going to be able to respond to your swipe. You’re better off using other networking methods unless you have the ability to pay for it. You can set up your account and interests, but if anyone swipes right on you, you are unable to respond unless you subscribe. Most of the users aren’t going to pay the $20/month just to maybe get a match that meets their standards. At least you can view their linked accounts, so if you do use the free version, make sure to link your third party accounts. For an app that’s clearly still growing the subscriptions they are asking for is a rip off. This apps isn’t for people who work with their hands who are looking for better opportunities. Mostly men on the app, so hard to find fellow women to network with. Also you get matched in other cities, so you don’t get mostly local matches. The matches I did get totally flaked. I only used the free version. Don’t bother. Hello, I am using this app to connect people. But I come across any random people who are not matching the criteria I am looking for. Then I have to pay to see who swiped me right. That is discouraging. When I get a new match I have to click on the match, close the app, restart the app, anything to get the notification go away. As someone who hates having notifications on their home screen it’s seriously annoying. Upgraded, but don't get all advertised features. Interesting app, but I upgraded to be able to see who swiped right. I don't get this feature or rewind or unlimited search features after paying 6 month upgrade. Getting no results from this app. Limiting the number of swipes per day is pointless, other than trying to get $$$ out of you. Or maybe there just aren’t enough users. The one person who actually proactively contacted me lives nowhere near me. Are way too overpriced. Can’t even swipe right or message people without forking over a significant amount of money. Pass. Don’t let this app fool you..
You absolutely have to pay to use this app in any real capacity. They give you about 5 swipes and then make you pay for more, or wait 5 hours. The app is completely gimped by that paywall. There is no actual use for this app unless you pay. I have been using this app for well over a year and I have made so many connections and none of them are serious about doing business. I would say just use LinkedIn. This app has wonderful potential, however, the in-app purchase is too forced. Having connections with professionals in the field is a wonderful thing and we shouldn’t have to pay $20/month (Which is absolutely absurd) just to send one message to a professional who swipes right on you. Also, you only get 12 swipes per 24 hours or so and you even count the X’ed swipes which is also bad. In a world where individuals are only trying to better themselves, you are forcing us to pay for this app when it’s inconveniencing us badly. Your UX/UI for Mobile is frustrating because it gives us no valuable inspiration aside from a quote that is way too large and then another forced ad to buy your PRO version. I want this app to succeed, but you need to fix a lot of things in order for that to happen. This app works kind like Tinder and Bumble except it’s for making professional connections or those you have a mutual interest in a particular field. The free version allows you to swipe on about fifteen profiles a day. If you and another person swipe left, then it’s a match and you’re able to communicate. The negatives don’t have anything to do with the app itself, but the people that create profiles. I’ve mistakenly swiped on a mutual match who is suddenly sales pitchy or persistently how they can offer their services to me. Um...I never said I was interested in buying anything from you buddy. Those profiles get a quick block and unmatch. I’m here to network and get to know like minded people not have a bunch of people spam me and try to make me buy their products. That’s not how to sell. Tinder like app which tries to charge you money to from the first time you try to swipe right on connections. Could not have enough time to learn and here they charge. Uninteresting profiles. I’ve met some great people on the app since joining last year. My only flag is that there are a few tech glitches. The most annoying is that the same person appears in my results daily, whether I ‘like’ them or not. No issues with the person - she seems lovely. But I would love to ‘meet’ someone new. It’s described to be like Tinder for Professionals. In essence, it’s a LinkedIn updated for 2019, encouraging connection and networking between peers in different industries with similar interests. I’m enjoying it so far, and recommend that you try it out. 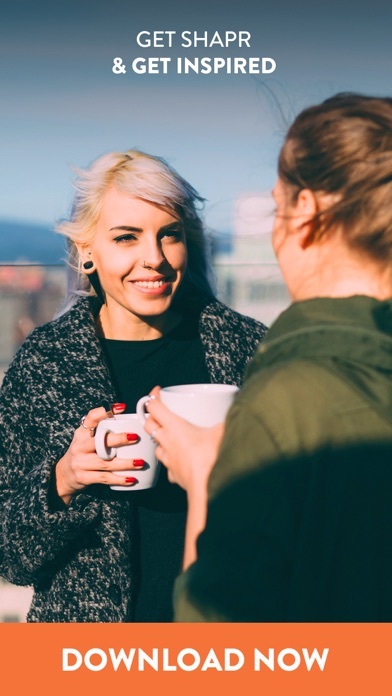 I’ve already started talking to several different people, and feel energized to network more actively, given that my primary experience doing so has been through conference events. Which I love, I do enjoy meeting new people, but I also have to recharge from for weeks after (introvert probs). This gives you 10-ish matches to look from per day, and you can connect or not. But it doesn’t overwhelm with choices, and sets you up to be able to grow your circle without the introvert exhaustion from peopling in quantity and sorting everything out yourself. Love it. Limited to 12 swipes every 5 hours. They want to charge you $20 a month for unlimited swipes. All just to meet a whole bunch of people looking for a new job too. Truly useless and a cheesy interface. Garbage just like Tinder. I don’t like the fact that there is an immediate paywall for me to use this app in its entirety. I really like the concept, but I don’t want to just spend $20 in hopes that I might like it. I would love to try this app out... sounds like it could be a game changer for my business. IF I COULD EVER GET IT TO LOG ME IN!!! Good app, but every time I open it, it asks me to give the account initialization details (name, interests, etc.) before I can proceed. I already gave them! Need a job? Us this app to spend money on your job search! No matter how many times I save my information, including bio (which I know works because it allows me to go through the swiping process and have gotten results so I know the profile is live), it makes me go through and save it all again every time I open the app. 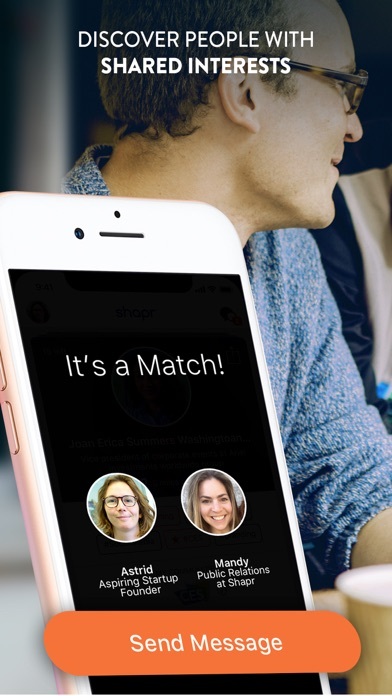 I think it walks a fine line between professional and dating/social focused app, and through the interface and types of selling points, often veers further into the dating/social side. This may work for some, but I think it could do better for professional networking. So far this app does not seem to be a great avenue to network. It presents good potential but your only able to see 10 possible contacts every 10-20 hrs. Why not just use LinkedIn and view as many potential networking possibilities as you want? I wish the connections were more region specific. I swipe through the list and only one or two are within my state. Also, I understand the purpose of the limited number of swipes, but I dislike it. It’s a great idea, but the execution of it isn’t great. With things like meetup and LinkedIn, I’m not willing to pay for things I can do free on those platforms. Got a message and replied but as soon as I changed an interest they were gone, so now my first connection is gone. TLDR: the “matching” algorithm doesn’t “match”, then they ask for your money to make it “match.” The concept is great but it seems like nothing else but a money-making scheme for the developers. You get 15 random “matches” a day - and they do seem very random; more than half of them have nothing to do with my industry and the rest are other people in my industry who are looking for jobs just like me. Then the push notifications- “someone wants to hire you, give us $20 to find out who it is” is the gist of it. To actually *search* for people who may be valuable to network with, you also have to pay for that. I will give it some more time to see if the algorithm improves, but the manner in which they manipulate users has put me off of ever paying. Not that it was really all that great but the free version is gone so don’t even bother downloading. Deleting. Did make a couple of business connections but mostly just people trying to get you to join their MLM or buy something. This is a great concept, but a terrible app. Shapr has so much potential. I wish it allowed you to upload more images of your work, because it would be a great feature for visual careers. The description isn’t long enough for users who have a wide variety of skills and multiple projects to offer. It’s also strange that the number of swipes are rationed, if you don’t pay for premium. I hope the app grows more users, because there is currently a very small pool to pull from. Love the concept of the app but it keeps matching me with people I didn’t swipe and match with?? I’ve used this app for a month now, so far the only people I’ve met are interested in getting me into their pyramid scheme or convert me to their religion. I don’t know whether it’s only me or if this happens to all people. I’ll continue checking out this app and see whether I can find someone who’s actually worth networking with. So far sales seems to be the main thing going on everywhere. The idea of this app sounds great. But the free version is basically useless. You do not get any type of use from it unless you pay. Just a heads up for anyone looking for free app to network this is not it. As an introvert, it’s very hard for me to go out and actively talk to people and because of this I’ve started reaching out to more people via social media and things of the like. 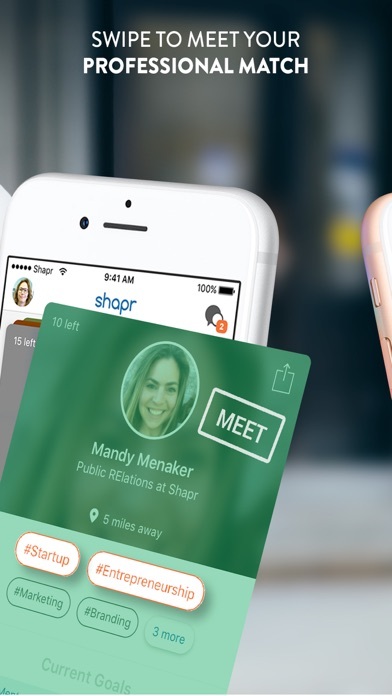 Shapr has alllowed me to explore a platform which enables me to meet new people who have similar goals and interests, and actually act upon our connection through voice calls, video calls, coffee meetups, etc. Everything is really simple, too. You fill out basic information about yourself and from there you can add goals and tags relating to your interests. From there, Shapr sends you a batch of people based on your goals and interests. You swipe right if you’d like to meet with a person, and left if you’d prefer not to. 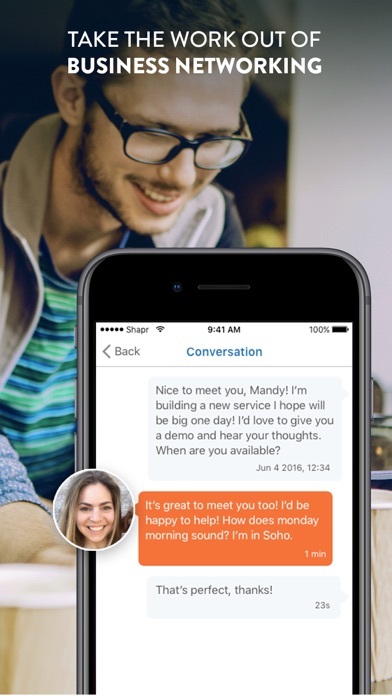 Think Tinder and LinkedIn in one app. I got a paid summer internship from this app. I was able to eventually connect this individual on LinkedIn and DM’d him my resume. Without this shapr app, there is a 100% chance I would have not known about this. The opportunities are endless. It's a great way to connect with folks. The only problem is that it always says I have a notification when I don't and get frustrated not knowing when I do and don't. Can you fix this please?? What do you get when you put the world's sales people on one app? A terrible experience. And one last time, no! I'm not interested in joining your scammy MLM. I shouldn’t have to pay to LOOK for a job. Obviously something isn’t working out right here. ...I don’t have money...I need money to look for a job... I need a job to have money. Terrible model. I just started using Shapr. And first off, to search someone and then connect with whoever appears under the search results you must pay for the app. The next thing is that I’m unsure how many of the people on the app are using it for its intended purpose which is to find jobs, not find dates. So I think it’s slightly tricky/ can get unprofessional very quickly unfortunately.